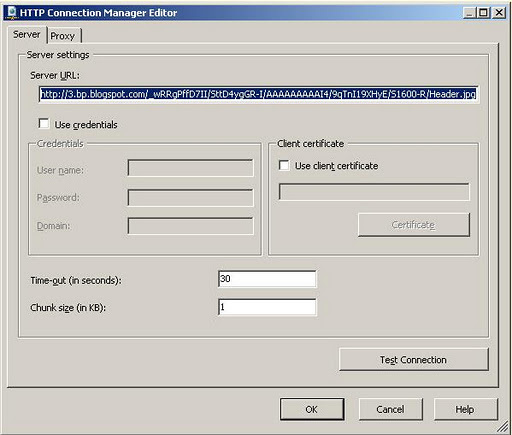 Download file via HTTP connection task would have lots of coding in .NET but in SSIS this task become much much easier with the help of “HTTP Connection Manager” , “HTTP Connection Manager” is one of the connection member of rich set of stock connection in SQL Server 2008 integration services. Let us move ahead with creating package which can download the file from HTTP. Open new SSIS project. 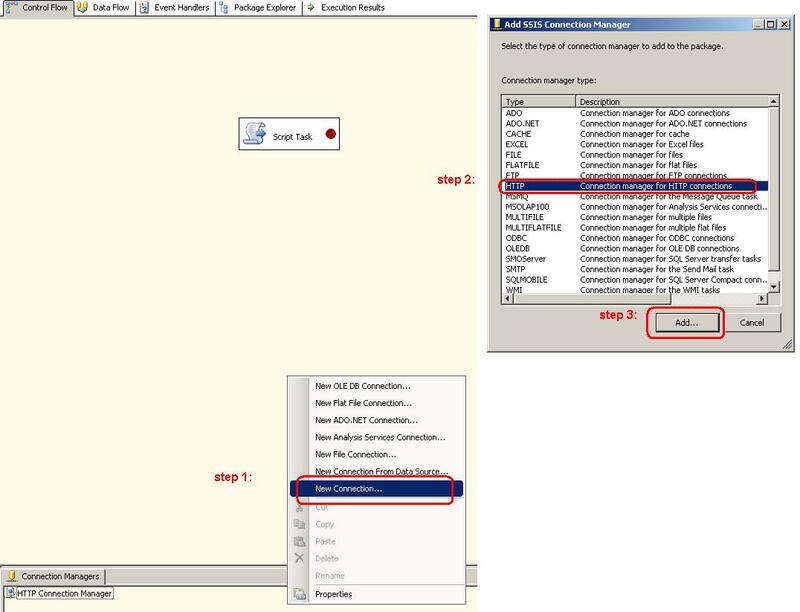 To add “HTTP Connection Manager” in your package, right click on “Connection Manager” window and click on “New Connection”, from the “New Connection” dialog box, select “HTTP” and click on “Add” button. Once you insert “HTTP Connection Manager”, double click on it to configure. It will open dialog box editor, you have to give the path of file you wanted to download in “Server Settings” property. I wanted to download my blog header so I am giving path of the same which is as below. for more detail, look at below screen shot. Once you are done with setup of “HTTP Connection Manager”, drag “Script Task” from tool box and drop it to the “Control Flow” which is your design area. Double click on “Script Task” to configure it and click on “Edit Script” button to write down script. In the MAIN() method which is our Entry Point, I am going to have following script. As soon as you copy the script there, save and close script editor and run your package by hitting F5. You will see file created at the destination path. In this case, I would found SQLHub.JPG in D drive of my system.